You need this instant pot cherry cobbler in your life! With the sweet-tart cherries and the chewy cobbler topping, it’s perfect for a holiday meal or just an ordinary Friday night. 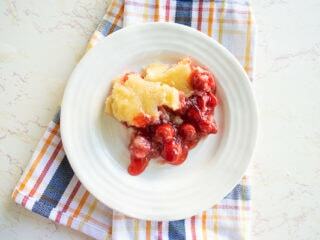 Instant pot cherry cobbler is delicious as-is but even better with a scoop of vanilla ice cream. The sweet cherry filling tastes so good next to a cold spoonful of creamy ice cream. Plus the chewy and sweet cobbler? You will be in heaven! You are just 6 ingredients away from this yummy instant pot dessert. When picking a cake pan for the instant pot cherry cobbler, make sure you pick one that is not designated for cheesecakes. All though I love my fat daddio push pan, it is not right for this recipe. You will want to use a pan without any crevices on the bottom, or your cherry filling will leak out. I recommend the fat daddio 7-inch cake pan. Cobbler topping continues to firm up as it cools. When you take it out of your instant pot, it may still seem soft. Let it cool down completely and the cherry cobbler topping will firm up. This recipe originally called for 25 minutes on high pressure. I have since increased the cook time to 30 minutes after receiving feedback that 25 minutes wasn’t quite enough time. You need this instant pot cherry cobbler in your life! With the sweet-tart cherries and the chewy cobbler topping, it's perfect for a holiday meal or just an ordinary Friday night. Fill the inner pot of your instant pot with 1 cup of water. Place the trivet inside. Grease a cake pan (that fits inside your instant pot) with cooking spray. Pour the cherry pie filling into the cake pan. In a medium bowl, mix together the sugar, flour, and salt. Slowly drizzle in the melted butter and vanilla extract. Mix together with a fork until the mixture is wet. With clean hands, grab clumps of the cobbler dough and squeeze into a ball. Then flatten into a round. Place on top of the cherry pie filling. Continue making rounds with the cobbler dough and arrange slightly overlapped on top of the cherry pie filling. Place a paper towel on top of the cake pan and cover that with a piece of aluminum foil. Crimp the edges to prevent water from getting into the cherry cobbler. Create a foil sling with a long piece of aluminum foil folded into thirds. 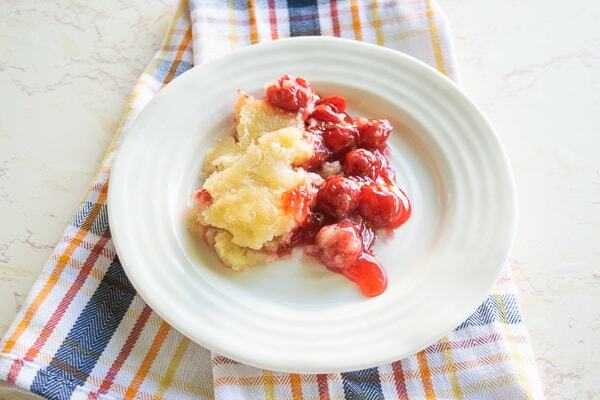 Use it to slowly lover the instant pot cherry cobbler into the instant pot. Gently fold the ends of the foil sling over top of the covered cake pan. Close the lid and set to "sealing". If a browned cobbler is desired, place the uncovered cake pan under your oven's broiler for 2-3 minutes. 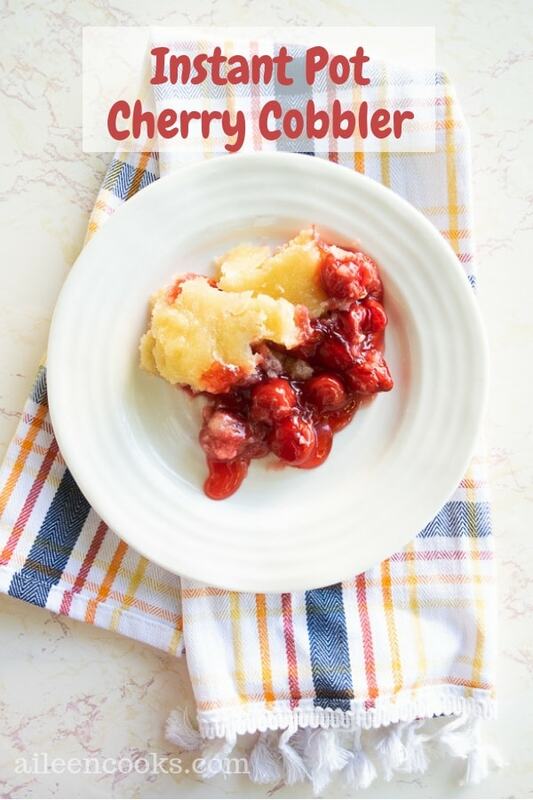 This recipe for instant pot cherry cobbler was so good. I love that it saved space in the oven for other dishes. I love finding dessert recipes I can make in my Instant Pot – thanks for this one. It looks vibrant and perfect for festive eating. Thank you, Lucy. I hope you enjoy it! This looks so delicious! I’ve never made cobbler but now I really want to give it a try!